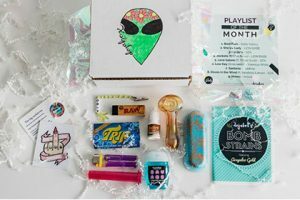 PufferBox offers excellent smoking subscription boxes filled with a variety of items carefully chosen to enhance your smoking experience. The boxes are delivered every month and every delivery brings you different goodies to enjoy. The items you receive with your PufferBox subscription can be divided into 3 distinct categories. 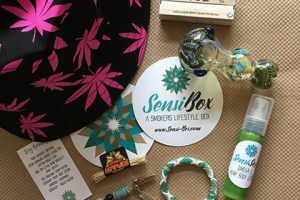 You get glass, normally 1 gorgeous piece of glass per box, delicious and colorful post-smoke snacks, and amazing accessories ranging from cool lighters, grinders, pipes, and rolling machines to apparel. You usually get 6-9 items per delivery and the average total retail value per box is between $50 and $70. You can choose from 3 subscription plans of different duration. If you opt for the monthly subscription, you pay $25 per box. With the 3-month subscription, you pay $24 per box while the 6-month subscription allows you to get your boxes for $23 per delivery. All subscriptions are automatically renewed but can be easily paused or canceled. Your boxes come with discreet shipping that costs $3.99 per box. 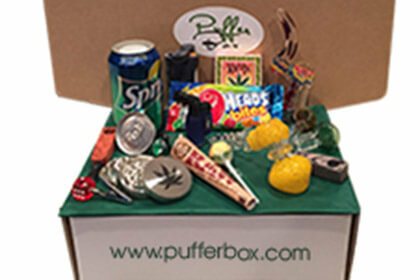 If you want to get even more Puffer goods or you need cool gifts for your friends, you can find great smoking accessories in the PufferBox online shop. There you can purchase a variety of pipes, ashtrays, rolling trays, machines, mats, Banksy-inspired T-shirts, and much more, with prices ranging from just $2.99 to $69.99. Our ratings are the result of an objective and independent evaluation of PufferBox, generating the final rating that reflects the overall quality of the product. Ratings may change as the service changes. No user reviews yet! Be the first to review PufferBox. We found 0 verified PufferBox promo codes for April, 2019. There’s no PufferBox coupons or discounts right now.